Instantly recognisable owing to its spotted coat, the Dalmatian is a sleek, muscular breed of medium size, with a massive amount of stamina. Intelligent and devoted, it loves nothing better than to run and play with its master – often for hours – and is totally people orientated. The Dalmatian’s affinity with horses is well documented. Developed as a coaching dog in 18th century England, it was earlier used for hunting and guarding in Dalmatia, Yugoslavia. Despite this, the Dalmatian is a friendly and non-aggressive breed which makes an ideal family pet. However, it can be a little boisterous for very young children and is best suited to an experienced dog owner. Good with Children: Yes, but best suited to children over the age of 6 years owing to its exuberant nature. 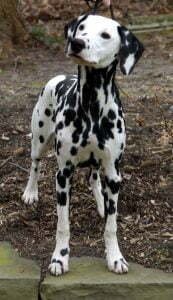 The only spotted breed of dog, the Dalmatian is instantly recognisable by its short, black or liver spotted coat. Other colours include blue, brindle, mosaic, yellow and tri-colour, though these are very rare. The Miniature Schnauzer is a stylish show dog who loves family life. With an excellent temperament and character this breed will adapt easily to the lifestyle of the owner, being a robust and sturdy little dog. The eye catching colouring of a Miniature Schnauzer, as well as their non shedding coat, makes them a low maintenance companion for the family. 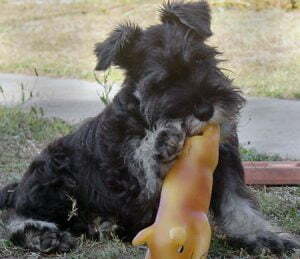 You will find that your Miniature Schnauzer has a large personality, always happy to join in the fun and games with an exuberant personality, easily accepting new additions to the household – whether people or other animals. For anyone who wants a dog that is adaptable, a manageable size and doesn’t shed their fur, as well as being very friendly and easy to train, a Miniature Schnauzer has it all. At the time of writing, the Shih Tzu (pronounced shi-zoo), is one of the most popular family dogs in the UK. It is also referred to as the chrysanthemum dog, because of the shape formed around the nose and mouth when the fur first starts to grow, which resembles the flower. The plural of ‘shih tzu’ is also ‘shih tzu’. This dog breed is generally good natured, non aggressive and just loves being with its owners. They are very cuddly and fluffy, and they are known as non-shedding, so are often suitable for those who suffer from pet allergies. Actually, the shih tzu is not completely non-shedding – see the below Grooming section for more detail. What is the difference between a Shih Tzu and a Lhasa Apso?